Even though the bookworm life is mostly cake and marvellousness — there are some lies we bookworms tell ourselves. WE CAN’T HELP IT. The bookworm life is fraught with danger and sometimes we lie to ourselves to keep calm. For instance, at first you go into the bookworm life with the intentions of only casually reading a book. Next thing you know? It’s consumed your soul and you want to grow up to be a bookshelf. (There’s nothing wrong with this. I’m sure it’s healthy.) Most bookworms will DENY THIS FACT. But it’s true. 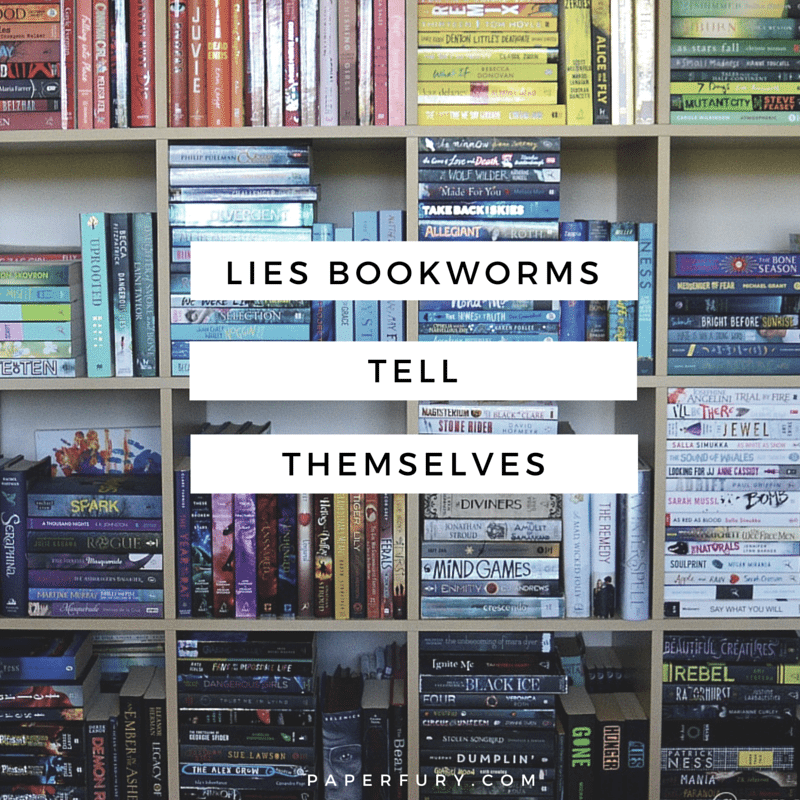 So!…today I have nicely gathered a list of popular lies bookworms chortle. Because you’re only going to read just one little teeny tiny chapter. HA HA HAHHAHA. No. This is such a lie. You will read copiously. Your eyeballs will fall out of your head. You will spend the next day running on coffee and sneaking naps under your desk. You are a grand delusional fish. Nobody reads just ONE PAGE. Do you eat one potato chip? Do you snuggle a puppy once? Do you conquer one country? NO. One is just not a good number. Reading 342 pages is a much better idea and your eyeballs know it, your heart knows it, your left elbow knows it — only your brain is in denial here. Even if you get rid of books (because while this makes pineapples all over the world cry, it is actually an okay thing to do under pressure), there is no such thing as having “enough bookshelves”. Even if you don’t display books, do you know how handy bookshelves are?!? You can do SO MUCH. Including stacking photos, or crafts, or knickknacks, or buried treasure you have wrested from the hands of a fearsome dead pirate. Books aside — options are endless. But going back to books…raise your hand if you actually have enough shelf space and are satisfied with it?? See what I mean?! I’m like 99% sure you’ve** envisioned yourself as a fictional character at some point. * This happens all the time right? I’m sure it does…average day. ** If I read a book with a queen in it, you can just imagine what position I envision myself. Cake for correct guesses. If you haven’t said these lies yet….you probably will. OH THIS IS ADORABLE, ISN’T IT?! I mean some books are truly relaxing. But authors have this odd habit of going “Look at this adorable world and these adorable people having adorable lives with adorable happiness — NOW LET’S SMASH IT WITH A HAMMER. MWAHHAHAH.” And they leave readers crippled in trauma. Reading is so stressful. I have like 9 grey hairs because of reading and anxious paper cuts from turning pages too fast. Also there was that one time my heart gave out?? That was awkward. But death is an acceptable part of the bookworm life. I…um…screwed my bookshelves to the wall. This is normal, right? And plus, ignoring the fact that the bookshelf is heavy and might fall — I’m also dutifully concerned about the Tree Apocalypse. What if all the trees come to life and come for revenge on their dead brothers? HAVE YOU ThOUGHT ABOUT THIS???? Bookworms will be murdered in cold revenge. Please. Ignore the lie. Screw your bookshelves in place. Batten down your books. Stay away from nature. Be safe. I have dropped books on my face before. You know that moment when your arms get tired but you’re so engrossed in the book you don’t realise your fingers slipping until — WHACK — it’s like a faceplant but in a book. A bookplant? A baseplant? Or paper cuts. Dropping hardcovers on poor feet. Straining your back from carrying too many. Crying an ocean of tears due to feels and then partially drowning yourself. Smacking the book against your head when a character does something stupid. Seriously = harmful things happen. Don’t lie to yourself about any of these. I’m onto you. * Of course you trust me. You’re at my blog! You keep coming back! You know I speak 100% truth ALL OF THE TIME. I acknowledge your trust. have you ever told these lies to yourself? which ones do you relate to most?? can you add other bookworm lies to my list?!? THIS IS PAINFULLY ACCURATE. Although… my bookshelf is on the opposite side of my room, so if/when it buckles under the immense weight of all the books I’ve crammed onto it, then I’m quite safe. (Thank god. But the books would probably get squashed, poor things.) Another one is, “I’m just going to borrow ONE book from the library today.” HA. Also, I’m first comment!? WOOO. I’m 100% sure I deserve cake. Or chocolate. Or both. AHHH FIRST COMMENTER CAKE FOR YOU. (I’m still dying of laughter that this is even a THING. 😂) Ahem. If my bookshelf fell (which it wouldn’t because I screwed it to the wall #wise) then it would block me in my room. Which isn’t SUCH a bad thing??? Except I would need food, but people could pass it through the mountain of books. *nods* AHEMMM. Yes, all so true! Haha, I definitely need more bookshelves. Unfortunately, there is no space for any of them!! Plus, whoever said reading is relaxing lied. Never have I read a book that was relaxing. There is always one character, one problem that makes everything worse. But, if there were no problems, what kind of book would it be worth reading? Awesome post! Totally agree with each and every one of them. Omg, I just managed to wrangle more shelves into my room AND MY LIFE IS INFINITELY BETTER. I even have empty space (!!) so ergo I must fill it (!!) ahem. ;D And omg books are just not relaxing, are they??? I mean, even if they ARE being relaxing…they turn out not to be because SOMETHING HORRIBLE GOES DOWN. Aw, thanks, Amber!! I really appreciate this! CAKE FOR YOU. All of these are 110% tru– Wait, did you say you SCREW your bookshelves into the wall? That’s crazy! And just a little bit brilliant..
HAHA YOU’RE AMAZING. I’ve probably never been that dedicated in reading…omg. Although my sister did get on a “book ban” for reading so much before school that she was always messing up with her work (we homeschooled btw. hehe) Or she wouldn’t even START her work. 😂 BOOK ADDICTS LIFE FTW. Great post though, Cait. You can now rule the world, as usual. HAHAHA. I DIDN’T THINK SO EITHER. BUT THEN I GOT INSPIRED. 😂 So now we know all my random tweets have the potential to turn into posts…ahem. 😉 Omg but YES I DID ATTACH MY BOOKSHELVES TO THE WALL. Well, my dad did. Because no one trusts me with tools (no clue why…ahem). And omg, that awkward moment when the parent tells you to do something and your’e like “yup just about to”…and then half a book later you realise you didn’t 😂 AHHH THE AGONY. Omg, pretending one is in Hogwarts sounds like the perfect way to get through school. *nods* I APPROVE OF YOUR LIFE CHOICES. All of these things! Apart from that I can stop – I’m not even going to pretend that I can, and I don’t want to anyway. I would add to the list “I’ll just take a 10 minute break from studying and read…” NOPE! Turns into an hour, at least. I’m guilty of ALL of these. I have said I would quit after one more, hurt myself with a book, assured myself I wouldn’t get invested, denied that I need more bookshelves, wondered if books will fall on me in my sleep, and assured myself that my TBR is COMPLETELY under control. Are these lies? I assumed they were book worm mantras, or book blogger bill of problems. #2, #3, #6, #8, #9, & #10.. #8 literally made me laugh. I don’t have my screwed bookshelf near my bed but bellow it are just my laptop and art materials. So no, I guess there’s nothing to worry about it falling on me and possibly burying me alive. And I would say that reading is relaxing, in a certain definition of relaxing. It certainly does a good job of helping a girl forget all her actual problems- by replacing them with the issue of fangirl feels, but would you rather be stressed over calculus and college or yelling at the author for hurting your babies? Omg the “let me go to bed early…” and then starting a new book IS TOTALLY ME. I DO THAT A LOT. Or else I decide to finish off the last few pages of one before I plan to sleep…and THEN I CAN’T SLEEP BECAUSE THE BOOK IS GOING ROUND AND ROUND MY HEAD AND AFJDKLASFDJK. BOOKS. Not relaxing things in the least. BUT I HAVE TOLD MYSELF ALL THESE LIES, CAIT. This is why I don’t let myself start reading a book late at night, unless I’m feeling especially weak (which, you know, happens all the time). I don’t have my bookshelves near my bed anymore because books would sometimes fall off in the night and hit me in the head. #true story So now my bookshelves are across the room from me, which means I have the added benefit of being able to sit in bed and stare at them. And yeah, reading is /not/ relaxing. I think I had about twelve heart attacks in just the last two hundred pages of Illuminae. It was traumatic and I think I died a couple times. I always need new bookshelves. I just moved, and I brought only half my books and three bookshelves, and yeah. I need more bookshelves. HOW DID YOU KNOW CAIT, HOW DID YOU KNOW THAT I WANT TO BE A BOOKSHELF WHEN I GROW UP? My bookshelf is opposite my bed? So if it fell it MIGHT miss me…or crush me flat and RIP Cait. *nods sagely* BUT MY DAD SCREWED IT TO THE WALL HE IS A GOOD DAD. Reading is totally never relaxing. I mean, even if it IS being relaxing…then I get suspicious that something particularly dastardly is going to go down and make me sob 9 buckets of tears. YOU WILL BE A FINE BOOKSHELF WHEN YOU GROW UP. I BELIEVE IN YOU, LIZ. bahahaha yes to all of these. hilarious. i used to have a dvd obsession and before i moved, i had 900! my shleves were on the wall right above my bed. one night, my cat jumped up there and almost fell, and she dragged half a shelf with her. i swear to god, i almost pissed my pants and screamed, it was terrifying. sooooooo my bookshelves have never been anywhere near my bed hahahaha! OMGGG THAT SOUNDS TERRIFYING!! 😂 I’ve never had tons of things fall on me (yet, I mean, my bookshelf is next to my bed *gulps*) but I’ve had a cat jump on me in the middle of the night and I think I lost like 398 YEARS OFF MY LIFE. I can honestly say that I have never been afraid of my bookshelves falling on me at night. My father has made all of my bookshelves and insists on screwing them into the wall at the middle and top with brackets. It is amazing of him to do that for me but now I am never going to be able to move. My bookshelves are literally attached to the walls. Even if I can get them off (which I’m sure my dad could easily but I couldn’t), I would then have massive holes in the wall. I shudder at the thought of moving. Most of these are amazing, O Wise Queen Cait. Thank you for sharing and I hope you have a fabulous weekend. HAHAHAHHA OMG I BET. Ahem. *composes self* I mean, of course not, Alyssa. I’m sure you would never fall this low. Agree x 10. Especiall the one about reading not being in addiction. i keep telling myself that now that I have a job and live in a different country I should read less and spend more time exploring the country and meeting new people. But at the same time it’s a comfortable routine when everything else around is new and changing 🙂 Anyways, great post Cait! Omo I snorted so bad at number five. UNASHAMEDLY GUILTY OF THAT ONE. ALL. THE. TIME. Oh my goodness, these. The “Only One More Page” one gets me all. the. time. And I seriously have to monitor myself or I will read all night and never get sleep ever again. D: But WHY WOULD YOU TELL YOURSELF YOU COULD STOP READING IF YOU WANTED TO? WHY WOULD YOU WANT TO? DON’T STOP READING. IT IS GOOD FOR YOU. AND IT IS FUN AND ENTICING AND TRAUMATIZING IN THE BEST OF WAYS! And, finally, I have admitted to myself that I do not have my TBR list under control so that is me moving past it, I guess. This is so funny and true. Excellent post, Cait! 11. I have never told any of the lies above. x) Why are your posts always the best? OMG YES. The perfect conclusion. 😂 Ahem, well my posts are perfect because I am perfect. NATURALLY. Generally speaking, I am LESS invested in a series when all the books are out when I start reading it. 🙁 Don’t ask me why. Maybe it’s the lack of gaps between books which allow all the excitement, suspense and tension to build up. And injuring yourself, oh my god yes. Whether it’s books falling off over-burdened shelves or paper cuts…I’m clumsy, okay? I’ve never understood why people read on the beach and claim it’s relaxing. Like, if the book isn’t tearing your heart into a million pieces, why are you even reading it? It does lower the fretting factor, right?! Except I tend to just flail uncontrollable when I know I can actually devour the WHOLE series at once. 😂 I HATE WAITING. I like to think I’m not too clumsy? And then I try and walk while holding books and realise that is, in fact, a lie. I even walked into my bookshelf the other day. WHAT IS LIFE. I AM GUILTY OF ALL OF THIS I can’t. This is too true. Why must these things happen to me? But you know, I would rather live in a cardboard box, with many book related injuries, while pretending to be some fictional character, then not be a bookworm. You are totally right, once a bookworm, always a book worm. There is no going back. I am trapped. But lets be real here, do I even want to go back? Never. This post is in fact, hilarious though. I Love IT. Nope, I’m not guilty of one single one of these. Nope, not a single one. Especially not number 6. Nope. Not this girl!! Oh yes it was perfectly believable, Lisa. I am not doubting you AT ALL HERE. NOT AT ALL. Dropping the book on my face. -.- All. The. Time. OMG I RELATE TO THIS CONVERSATION A LOT. That is so me.😂 I read to relax yet reading is anything but relaxing?!?!? I mostly accept the truth that I will never have enough shelves. BUT I LIE ABOUT THE “ONE MORE PAGE” ALL THE TIME. 😂 Omg, needing a new house is a grand idea. I’ll put that on my to-do list. This escalated soooo quickly I was dying!!! xD OMG these lies are too true! Sometimes I think to myself, yeah I should totally wait until the whole series is out than I don’t need to wait and stress and I can be so happy reading it, but than I remember I don’t have that kind of willpower. sigh. Also, “This will be the last book I buy this month.” that lie happens a lot. It’s probably an irrational fear, never going to happen *eyes bookcase* right. It would be the worst tragedy right?! SOMEONE WRITE A BOOK ABOUT THIS. ahem. Screw those shelves to the wall, Skye. BE SAFE. YOU ARE SAFE, tHEN, KELLY. BASK IN YOUR SAFENESS. Yes. For all of these. And I think EVERYONE has pretended to be a character from a book at one point or another. I remember running around in the woods with my decidedly non-bookish cousin pretended to be demigods when we were like ten (or maybe possibly older. It is very fun to whack things with sticks that you’re pretending is a sword). OMG THAT SOUNDS WONDERFUL. 😂 My sister and I were really into Roman history when we were small…and…we may or may not have been really fond of reenacting the colosseum. *ahem* I’M SURE THAT’S NORMAL NICE CHILDHOOD BEHAVIOUR. #6! Oh dear, #6 is so very much me. Some of the others too, but… #6 especially. Are you being run out of house and home from your TBR, Nikki? *pats shoulder* There there. Me too. To add to # 9: I have never physically harmed someone else with a bok either. And ugh, bookshelf space. I just bought Passenger and I look at it’s 450 pages and weep. I need a whole new shelf for my books because I can’t help buying/accumulating them alll. Most major publishers have a FSC (forest stewardship council) approved paper for their book, which means that it’s ethically sourced and not destroying virgin forest and all that (I learnt about this in my science class) I also lie to myself about how much money I’m willing to spend on books, and that i don’t need more books. Thanks for this horribly accurate list, Cait! Of course not, psssht, I haven’t accidentally smacked my sister (a little harder than I intended) with a book to sum up my feels. I wouldn’t do that. I am so calm and nice. OMG PASSENGER. <3 I hope it's awesome. XD I have it on reserve at my library!! Oh wow but that's nice about the book pages! I AM IMPRESSED. Clearly you will survival the tree apocalypse. I will probably not. RIP me. Pssh. I don’t know what you’re talking about. They’re totally true. I can totally read just one chapter or just one more page… I don’t have a book problem. Heh. Yeah… Okay, so I guess I do. & Those are lies I’ve definitely told myself. Expect maybe the “one more page” bit. I don’t think I’ve ever said I’d only read one more page. I ALWAYS have to end at a chapter or, you know, at the end of the book. That accidentally hurt yourself with books happens to me ALL THE TIME now though. Talk about hazards of working in a bookstore. Papercuts galore! Mysterious bruises. Carrying way to many books all the time. Yup. That’s definitely me. I think the “one more page” is basically a lie ALL OVER THE UNIVERSE. 😂 I mean, one needs to end at a chapter, right? Or better yet…the end of a book. *nods* And omg, I hurt myself with books so often, particularly dropping them on myself, and then I howl because a) I hurt myself, and b) I potentially hurt the book. THE BOOK IS PRECIOUS AND CANNOT BE HURTTT!! Hah! These are great. And I have to admit that one of my bookshelves IS screwed into the wall. I’m pretty sure it would have been a goner a long time ago if I didn’t. haha It’s not a problem. Nope. GO YOU. Being pro-active and being safe. :’) YOU ARE A STAR AMONGST BOOKWORMS IN THE SAFETY CATEGORY. YES, and YES! I do tell myself and others these lies. Especially the “Just one more page,” one. My mom will say something like “Leah, can you unload the dishwasher?” Then I reply with “Can I finish this page/chapter first?” “Sure,” she says. Then she sees me twenty minutes later and asks “Have you finished that page?” At which point I then set my book down and put the dishes away as fast as possible. How about “I’m just going to read for ten minutes to relax before bed”? Umm, yeah that never works out. I was exhausted one day last week and did that. Big mistake. Next thing I knew, it was midnight and I COULD NOT STOP. The book just completely sucked me in. I really should have known though. I actually fear for my life because of my bookshelf. It goes all the way to the ceiling and overlooks my bed. An earthquake or even a mild bump from a casual passer by would threaten its structural integrity. I’ve have to push all the books back to the wall instead of having them at the front of the bookshelf so it doesn’t topple over and crush me in my sleep. Man, this post is too accurate. Oh #9! I call that a “kindle attack”. My husband says thats how he knows he needs to take my kindle away and make me go to bed (because of #1!). Great list! NUMBER FOUR AND NUMBER EIGHT ARE SO TRUE. (You are right, mother. I am addicted to books. But I mean, I can still quit whenever I want to.) Also for number eight, the fear is real when you live where I do. Which, uh, happens to be in one of the largest earthquake zones in the world. Ahahaha. Whoops. It’s too late to turn back from my book addiction now. Pfffft, what do parents know when they say we’re addicted to books? I MEAN, WHERE IS THEIR PROOF?? *hides massive bookshelf and room full of books* Ahem. Omg earthquake zone. OKAY. I FEEL YA. THAT IS TERRIFYING. We are totally absolute little bookwormy liars. NO DOUBTS. I totally relate, I snickered to myself while reading the entire post.Especially the bookshelf falling and squishing me… mine did once collapse and the mess it made…… and I have never put that many books on it ever again. YAY I MADE YOU LAUGH *happy dance* Okay but making people laugh is like my #1 goal in blogging so excuse me while I SQUEEEEAK.😂 Ahem. But omg your bookshelf REALLY DID FALL?!? That is tragic. My mum’s shelf broke once and it was a wild mess. But only one shelf and not the whole bookshelf or that would’ve been scarily tragic. Well the whole bookshelf did not collapse just two shelves but it was kinda a corner shelf thing and it went everywhere…. but saying that one of my friends actually had a bookshelf fall on the once, almost their mum caught it though… but she remembered having her life flash before her eyes…. and she remembers it well even though it happened when she was like 6 or something! Although I don’t know just what caused the bookshelf to tip over onto her but it was a big one! I seriously relate to all, BUT NUMBER 5 IS ME! I always imagine myself as the characters OOH OH OR A CHARACTER THAT IS ALL ME /DROPPED INTO THE EXISTING FICTIONAL WORLD/. I tend to read books and get sidetracked because I imagine myself in the scenes interacting with the characters and I end up just creating my own story xD which is probably why i take forever to read books. Also the first time I watched Pirates of the Caribbean I imagined little running alongside Jack Sparrow and getting into trouble, and I was so lost in my own world that I had to rewind the whole film and watch it again. I missed the plot the first time around! Omg I forgot about ships!! *facepalm* And I would never eeever expect you to like any other character but the good holy ones *nods* Because that would be devious otherwise, Alyssa. And you are not devious, nope nope. LOL.. I CAN RELATE TO ALLLL OF THESE!!! *laughs nervously* AHAHAHA I’m such a great liar to myself. Literally every single one of these are true. Books fall on my face. One time, my aunt slept in our library/closet thing and a huge bookshelf fell on her. Heh heh heh… but she survived. OH, YOU MEAN I’M NOT ACTUALLY A BOOK CHARACTER? Nah, actually, I AM. Clara Mandras. From this book. https://www.goodreads.com/book/show/24022364-water-princess-fire-prince She looks like me, has the same hobbies as me, has the name I wanted to change my name to ten years ago, same preferences, similar personality, etc. SHE IS ME. I CLAIM HER. The other day I was chatting with my mom and I casually slipped in that my bookshelf was full and she said, “Well, why don’t you just get a new bookshelf? I’ll take you out to look for one.” I LOVE YOU MOM. YES. Am I a book addict? One word: YUP. OMG A BOOKSHELF FELL ON HER?!?!? THAT IS SERIOUS SURVIVAL SKILLS RIGHT THERE. (I’m glad she survived.) But zomg, I’m probably sure you are out of a book then. Who am I to judge unfairly and say you’re not?? I mean, WHAT WOULD I KNOW. Clearly she is you. CLEARLY. At any rate, you made me laugh really hard and now people are looking at me weird. Thanks. This is a total example of where some things just shouldn’t be pointed out. Yep. Never pointed. WHY HAVE YOU CURSED ME WITH HAVING TO (gasp) *ACKNOWLEDGE* MY FLAWS?! Ugh. Will have to sort them out now! I’ll never be able to convince myself that, “It’s okay if I just, you know, get 30 minutes of sleep, you know, totally normal!” or, “Bookshelves are an *investment* in my FUTURE, so books are organized and organized = good and good=no heart attack!” and so on EVER AGAIN. I’M SORRY HELEN. *falls to knees in apologies* BUT THESE THINGS MUST BE SAID, YOU KNOW IT’S TRUE. Although, tbh, I’m doing exactly nothing about these lies I tell myself. *flips hair* Let’s just go on lying, shall we? OMG CAIT – all of these are completely on point!! Including – *cough* – the uh, pretending to be a book character. I mean, not saying I’ve done it before…but…uh…I’d totally have figured that mermaid egg clue out faster than you Harry…but ANYWAY, I digress. I still wanna know why Digory was having a bath with the egg anyway. I MEAN REALLY?!? WHAT EVEN. 😂 AHEM. But yes. Go go enforce your bookshelves *shoos you away* Safety, Brett, SAAAAAFETY. I CANNOT STOP LAUGHING RIGHT NOW BRETT. 😂😂 THIS IS HILARIOUS. These lies are true. (see this oxymoron?) Especially 2,4,6. I tell myself the exact same things over and over and over again. OMG YES. Particularly when it’s late and the house is quiet and I mean…the book just starts demanding to be consumed all at once. HOW CAN WE SAY NO?!?!? (Spoiler: we cannot.) Ahem. AUTHORS ARE VILLAINOUS CREATURES TBH. WE THINK THEY’RE NICE TO WRITE US BOOKS? BUT AHHAHAAH. NO. I will only read one more page and reading is relaxing are TOTALLY ME. I love this whole post though, as I relate to each of them (except for bookshelves- I have bags-sad Huh? I am so glad I got to read another of your awesome posts. keep em coming!! You are so mcuh fun to read-thanks for the smiles!! I drop books on my face all the time! Some items my iPad too…that really hurts. Your a riot Cait! We are SAFE bookworms, you and I. We are like model bookworms and the world should follow in our safety steps. I seriously love all of your posts, but this might take the cake! Wait cake? YUM. Oops sorry distractions…. Starting books late IS a horrendous decision...and yet how are we supposed to resist?! BOOKS EXIST TO TAUNT US SO. I’ve told myself all of these lies except #8, and that’s only because I live in a terrifying earthquake zone so my bookshelves are attached to the wall already. The lie I tell myself the most is when I’m going into the library or the bookstore and I say “okay, I’m going to get THESE books that I already decided on and ONLY these books.” And then I leave with at least twice as many books as planned. Hilarious!! I have told myself all of these lies and many, many more!!! This was by far the most brilliant usage of an Emperor’s New Groove meme that I’ve ever seen!! In addition to often telling myself these lies and frequently book planting I have one other lie I constantly struggle with: I love loaning my books out because I love when people read things I love and love them too! Numbers 2,3, and 5 are literally me ALL THE TIME. I have one small book shelf that is double and triple stacked and there are books randomly shoved everywhere in between the other stacks of books. I don’t need to get rid of some books, what are you talking about? Exactly. I mean, what if you got rid of a book AND SUDDENLY NEEDED IT?!?!? That kind of tragedy is NOT worth the risk. “One more page” and “Just one more chapter and then I’ll go to bed” are pretty much the phrases that define my life. Also whoever says “reading is relaxing” has obviously never read Elizabeth Wein’s books. Omg agreed. I’m still thoroughly traumatised after Elizabeth Wein’s book. NOT LIKE I WANTED A CALM HAPPY LIFE ANYWAY. HAHA . OF COURSE NOT. Books are extremely dangerous. Especially if you’re standing on top of a VERY haphazard stool and trying to take out the bottom book from a pile that’s on the top of the bookshelf. Bad idea, Emily. *cries* I need more bookshelves. I STOLE MY SISTER’S BOOKSHELVES. I’M SO MONSTROUSLY PLEASED WITH MYSELF RIGHT NOW. I ACTUALLY HAVE EMPTY SHELVES IN MY ROOM, EMILY. OMG. LIFE IS GOOD. Ahem. But otherwise the standing-on-a-stool-and-doing-book-balancing-tricks is dangerous. I dropped a book very close to my dog once and now he doesn’t trust me. So this isn’t a book, but when I was at Shannon’s house on my air mattress, her Effie Funko Pop was mysteriously knocked over from her bookshelf, and dangerously close to my head. And it freaked me out so much. So yes, I definitely have the fear of books toppling all around me. This post is awesome and hilarious Cait! So what you’re saying is SHANNON IS TRYING TO KILL YOU?!?!??!? Omg. Shannon and her Hunger Games. Omg, I can just IMAGINE Illuminae’s awkwardness in hardcover. It was bad enough in paperback. MY HANDS HURT. I love love love hardcovers and I would collect all hardcovers if I could…but I won’t deny they’re a pain to read most of hte time. 😂 But at least the spines don’t crease like with paperbacks? HAHA Cait I love how I was like all “TELL ME NOW” and you literally TOLD ME NOW like 1 min later. NO REGRETS ever! Actually sometimes there are regrets, but that’s a post for another time. Ahhhh which am I most guilty of? Let’s see.. all of them? But really the WORST is the “I’ll just read one more page”. I did that the other night. I was reading a really amazing book, third in a series of amazing books, and I said to myself “self, you are going to read ONE more chapter and then go to sleep because it is 4:30 am”. Fast forward to 6:10, the book is finished, and I am ugly crying into my pillow. THIS IS THE STRUGGLE. Also, good call with the securing bookshelves. It’s a safety hazard and I know you lord over small human Franks on the regular, so this is especially important. And no, goodness, there are never enough bookshelves. ever. I parted with a few books (shocking, yes) and somehow ended up with double that number joining my shelves. It’s a conspiracy, I tell you! And yes, I wouldn’t want to completely crush my Franks. But PRAISE THE UNIVERSE I was given permission to abscond with my sisters shelves. :’) I know have empty space Shannon. EMPTY SPACE (!!!!) and I cannot even basically <3 Clearly I will fill it. Like. Immediately. And plus sometimes we must just fall to the calling of a book and do as it says and READ IT TO THE END. *pets books* We must not ignore the calls of the books. 6 and 7 particularly! Thanks for all the awesomeness! Literally every single one of these. I have read so much (just *one* more page…chapter…ahem) late at night that I have actually passed out into sleep from sheer exhaustion and character-related trauma and end up dropping the book (or Kindle) on my face. It’s amazing my nose is still straight. Hahaha yes!!! Everything about this is so so SO true! I kept nodding the whole time I was reading this! SAME. I do NOT get that “relaxing” thing. And even if it’s being mildly relaxing that just means it’s all going to go SUPER BADLY really soon. Ack this was meant to go on your weekly fury! And I can’t figure out how to delete it! My actual comment: I really need more bookshelf space. You’re so right. You can use bookshelves for so much! I’ve also actually walked around the woods with a bow since I’ve cosplayed as Katniss. XD Great post! Haha. XD I keep my hair long specifically for cosplay capabilities. Do you want to see pictures? Lol at ‘accidentally hurting myself’ – I cannot count the number of times I’ve been reading in bed and accidentally dropped my book on my face. You and me BOTH. We bookworms live on the wiiiiild side. The to-be-read pile comment isn’t funny at all. Not even close. Doesn’t strike a nerve. …Don’t even look at me like that! I know you mean bookplant as in faceplant. A TREE THAT GROWS BOOKS ALREADY BOUND AND AWESOME WOULD BE A GREAT TREE, IMO. Instead of harvesting apples, one could harvest books. I LIKE. I should stop telling myself #6 … it’s a sad case I’ll never win. This list is too accurate for my liking, haha! And how stupid to tell yourself you’ll only read the ONE page. Seriously. At least I’m not delusional and tell myself I’m going to read one chapter. Works fine by me. And then my alarm goes off to get up for work. OOPS. You know what’s super cruel though? I work at a used bookshop. My job is to scan as many books as possible to add online. Seeing 100+ books a day and not giving in to buy half of them? great. Not buying any of them? that makes me a super hero, right? I think you are especially WISE, Rachel. I mean, I don’t live near an earthquake zone, but I’m still going to take the precaution. *nods* OMG. YOU PoOR DEAR, SUFFERING THROUGH YOUR JOB, THOUGH. *pats shoulder* Plus how can you bear to leave books to wither alone? one must adopt them and give them a family. HAHAHA ok so starting with #6. no no no my TBR list is NOT under control in any way shape for form! Ive got over 200 books on it! Did I mention I just added 5 or 6 more to it this week? #8 no I don’t have nightmares they will fall on me. But I have had them that they are going to fall on my 5 year old since her toddler bed is near them they would squash her fist. #9 YES many times have I dropped a book killing a toe or two. Ive broken many a blood vessel. #10 I used to do this and have somewhat stopped. Of course being a book reviewer I don’t really have the option sometimes and then I just toss myself into a #Bookhole until the next one comes out. OMG. THAT IS TERRIBLE AND KIND OF SCARY. Protect the little potential bookworms!!! Book damages to one’s person though…omg. I think I strained my wrist reading a really heavy hardback once too…OH THE THINGS WE DO. THE SUFFERING WE GO THROUGH. Yep. This is so me! Awesome post! I’m pretty sure I’ve told myself each and every one of these lies. I think the one I’ve told myself most is “my TBR pile is totally under control, thanks for asking.” HAHA. HA. No. It’s not. Thanks for making me feel bad. I think another lie I tell to myself is, “I’ll stop buying books until I read THIS many.” HAHA. Again. No. I have a book buying problem and I’m okay with it. Oh my gosh, so much yes. I’ve had several “just-awkwardly-laugh-it-off-Kate” moments when something happens due to my “too many books” (ha! As if there’s such a thing!) problem. For example, when I was a young and innocent and delusional bookworm I thought it would be a fabulous idea to keep the books I was currently reading (which was like twenty at the time) on the headboard of my bed. And since I’m such a restless sleeper, my shifting around at night caused all the books to topple onto my face. But multiple scrapes and bruises? Pfft, no big deal when it comes to books. Oh! And then there was that time I bought myself a gigantic messenger bag instead of a normal-sized purse because it would allow me to carry my hardback copies of Cress and City of Heavenly Fire more easily. And then I actually got a lightning-shaped scar on my shoulder from the strain of it. My dad also had to worn me not to add anymore books to my bookshelf (*immediately starts to sweat nervously*) because the shelves were bowing in the middle . . . oops. OMG YOU HAD ALL THOSE BOOKS FALL ON YOUR FACE?!?!?! ?😂 I’m sorry.😂😂😂 I shouldn’t laugh but omg, Kate.😂😂 You’re adorably wonderful. But zomg, I approve of your bag-buying priorities. And I actually got like a cubed bookcase specifically?! So it’d have tons of support because omg that bookshelf is LOADED. I stole two of my sisters shelves (shhhh) and put them by my bed though and my dad was warning me not to overload them though. *gulps* They’re kind of wobbly? BUT WE BOOKWORMS MUST TAKE RISKS. I JUST LAUGHED OUT LOUD AT MY DESK AND NOW EVERYONE IS STARING AT ME. #6 is totally not true for me. I read them too fast. #1 however… I have school, so no coffee. Just sleeping during science. Damn it Cait now I’m scared of trees, both dead and alive. BUT EVEN IF YOU SCREW YOUR BOOKSHELVES TO THE WALL, YOUR BOOKS CAN CRAWL OUT AND ATTACK YOU?! I’m okay I just won’t sleep like ever again but that’s no problem because I can just read instead. “I’ll go to the Ithaca Friends of the Library Booksale and I’ll only spend as much money as I can afford”….BWAH HAH HAH HAH HAH! P.s. #7 is freaking life. My mom used to get onto me for getting too wrapped up in my books because if something happened, my moods would be affected for days depending on what happened in the books. I go to bed every single night telling my room mates to please come save me in the event that my bookshelves fall atop me in my sleep….